Michelle, founder of HigherOrbits, captured it for us. If you want to have a student’s perspective on the congress check out the Blogposts from BlueSat Members. 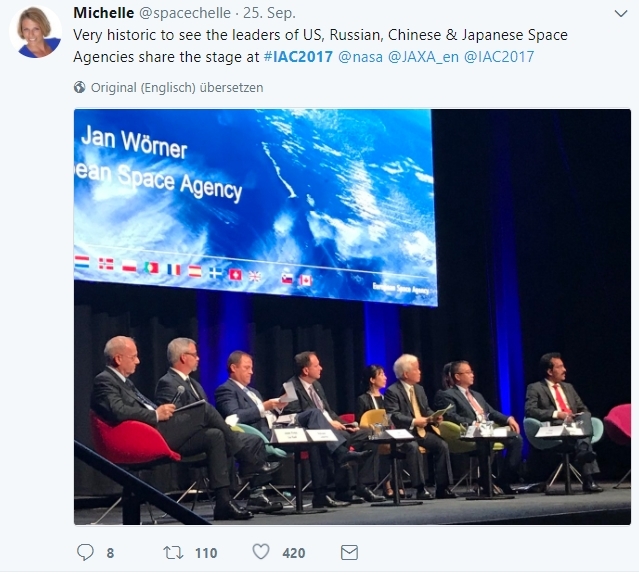 At the IAC 2017 opening ceremony Sen. Simon Birmingham, minister of education in Australia, stated that Australia will establish a national space agency. The Guardian is wondering what the Australian Space Agency is doing in the near future. And a lot of people were asking what the name could be. And no, oficially the agency is not called ARSE. At the IAC 2016 Elon Musk revealed his Mars Colonization Plan and was then criticised by some experts. One of them is Robert Zubrin who wrote a long article about his point of view and also gives some advice on how to do it better. For sure we will see further reaction in the coming days which dive deeper into the topic. Lockheed Martin updated their vision for Mars Base Camp. After Orions missions EM-1, EM-2 and the Deep Space Gateway the Mars Base Camp with lander, is the next step. Their video describes the vision very well and clear. Here you can see the complete conference presentation. In this presentation the Berlin based Part Time Scientists were mentioned and a picture of their rover had been shown to tell us how commercialisation of space could work. Congrats to PTS on that way! While I checked the IAC 2017 Main Programme and was searching for the term „NewSpace“ I stumbled upon Narayan Prasad Nagendra. He is, amongst other positions, the curator of New Space India. If you would like to know how the India NewSpace eco system looks like and how to foster it check out the newest article from NewSpace India. Maybe we can establish a few ideas in Europe as well. I was a bit shocked when I realized that the last newsletter I published is four weeks ago. I feel a bit sorry for delaying this newsletter but I think I have a good excuse for that. I had to organize the arrival of our newborn earthling :). See you in the next newsletter :).